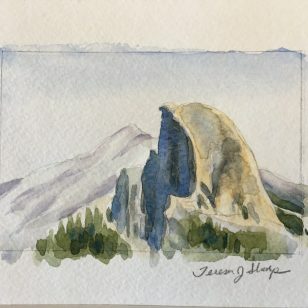 After a very prolific season of painting while living in Yokohama, Japan, I came to a complete stop as we repatriated back to California in August of 2016. This new season was filled with not only the unpacking and adjustments back to a driving culture instead of walking and using trains, but we also started a remodel project that (big surprise) turned out to be a bigger project than we had hoped. I would say that a lot of my creative energy went into the research, design and decisions involved in this project but I still felt unsettled and a little nervous about being away from my painting routine for so long. Oh and we got a little busy learning how to be Airbnb Hosts during our first year back in the states too. Our Airbnb space is the lower level of our house in Oakhurst, CA and by the way, I also had to get used to living in the foothills (feels like mountains to me) in an area that feels isolated from everything that is familiar in my home state. Ok, enough excuses. The point is I have experienced full fledged Artist Block for several months now and I thought I’d share how I’m pulling out of it. The first obstacle to doing artwork for me is not have a designated spot set up. When I don’t have a separate room all set up as an art studio, then the next best thing is an area that I can use where I can leave my work out at least as long as I’m working on a specific project. 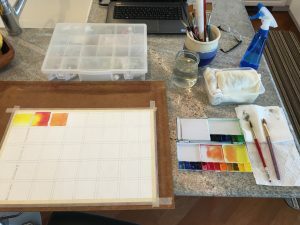 Another thing that helps jump start my creative juices is to go to another location where I can leave a set of materials (or they are provided for students)….like an art class or school. Last year about this time, I set up a cute little bistro table and chair in front of our fireplace on the edge of our living room and I painted a couple pieces of fruit but then I cleaned it all up and didn’t paint anymore (that was when construction started). While on a trip back to Japan in 2017 after construction was completed, I actually attended my old art school (Atres Art School, Yokohama) mainly to visit my sensei Masa san and fellow students but also to try to get my Artist vibe back. I’ll share that painting in another post. That did help remind me that the potential to create is still inside me but I came back into my new routine without art and got busy preparing for the holidays. 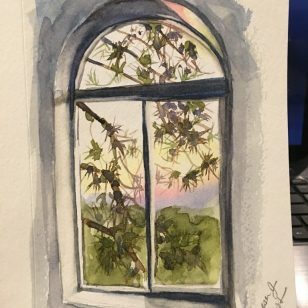 We kicked off this new year 2018 with another trip, this time to Paris, but I couldn’t make myself even sketch, let alone produce an actual painting while there. In fact I would say that my attitude toward myself as a non-producing Artist affected my attitude about watching the street Artists and even going to museums. It was a great trip full of good food and meeting up with a few friends while absorbing the beauty all around. It did inspire me to want to add to the beauty. You can see highlights from our trip to Paris here. Last week I prepared two areas for painting and tested which worked best. I decided the kitchen island, with its granite counter and a sink with adjustable stools was the most comfortable. The second obstacle to starting painting again is how to decide what to paint. 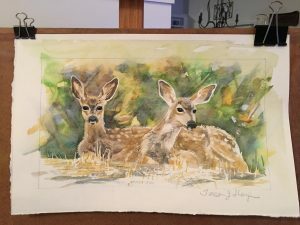 This time I jumped right into a project of a watercolor painting of two fawns, using one of my husband’s (Lenny Sharp) wonderful photos of the baby deer on our property. I wasn’t totally happy with the results but it was such an accomplishment to be painting again and I enjoyed the process. I considered painting another version of these same fawns to use what I had just learned but decided against it and instead started watching Youtube videos to inspire practicing basic watercolor techniques. One of my favorite online Art Teachers is Kateri Ewing who I found through Craftsy.com. I watched this video and a few others and then decided to do some of my own playful color-mixing. 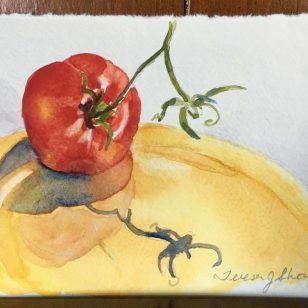 First I tried the more free flowing method with no plan…I really disliked how that turned out so I started again this time with a color mixing chart. 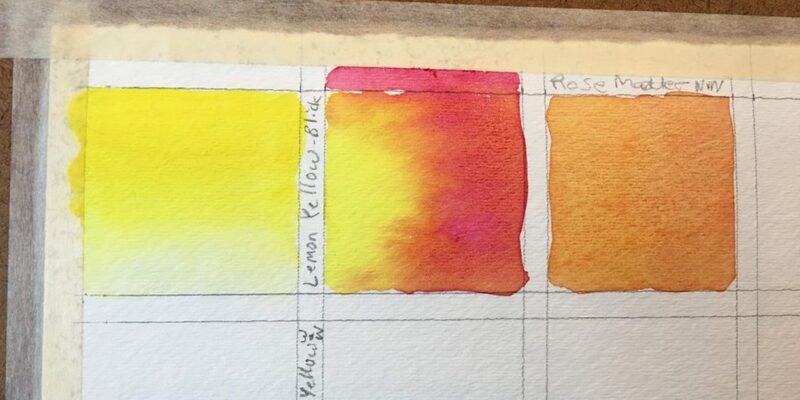 I wanted to compare all my yellows and see how they blended with my primary red (Rose Madder) and a few different blues. I did one square in a gradation wash, then side by side wet application of two colors to see how well they flow into each other naturally, and then one square of the two colors blended together before application. All of these yellows performed very similarly and I could have used a little more paint in the paint to water ratio on a few of them but it was fun and I now have a reference to compare what kind of an orange can be made and how bright each yellow is. 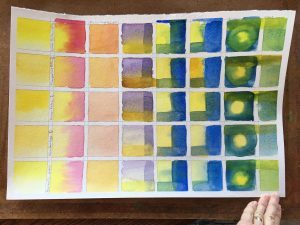 My yellow paints from left to right are Aureolin by Holbein, New Gamboge by Winsor & Newton, Winsor Yellow by W&N, Transparent Yellow by W&N, and Lemon Yellow by Blick. The Rose Madder is also by Winsor & Newton. Next I worked on the blues. Left to right I used French Ultramarine by Winsor & Newton, Cobalt by Blick, and Prussian Blue by W&N. I started by doing the side by side wet application to see how they moved into each other. After they dried I glazed the blue over that section (I wish I hadn’t because I lost some of that natural bleeding look). 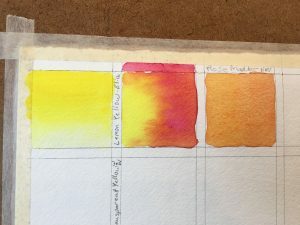 After I finished each yellow with the Ultramarine I mixed the blue with the Rose Madder, did a side by side with each yellow (since they are complimentary colors <violet and yellow> I was interested in the neutral color that it would produce (brown). As you can see they stayed a little more separate but it was a good experiment. I didn’t use enough paint so the washes were too light so again I glazed over each color in overlapping stripes after the first applications were dry. You can also see the effect of the Ultramarine and Cobalt blues glazed over the yellow/blue side by side bleeding experiment. The Prussian Blue I did each yellow in the center and the blue around the edges. After these dried I glazed each yellow in a strip all the way across. The last column is Cobalt blended with each yellow before application. This shows the subtle differences in greens mixed by using each yellow. The other thing I’m interested in but didn’t try yet is how easily these colors lift when a little water is applied to the dry paint and a tissue or clean brush is used to gently press or rub the color off. I like to do that sparingly in some paintings, especially to clean up edges that might have bled a little or to soften some hard edges. 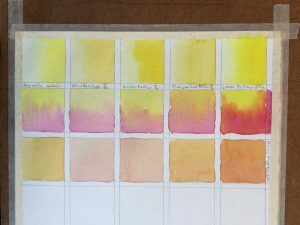 My next post will be about the painting of lemons that was inspired by all this practice mixing the different yellows. Subscribe to this blog to get the new posts as soon as they are produced. If you enjoyed reading about this please share it on Facebook. You can see more of my Art on my Artist Facebook Page . Thanks for reading about my journey as an Artist. If you enjoy creating (anything), please share in the comments how you overcome those times of feeling blocked.